Is your kitchen looking a little cluttered? Don't worry, you're not alone. 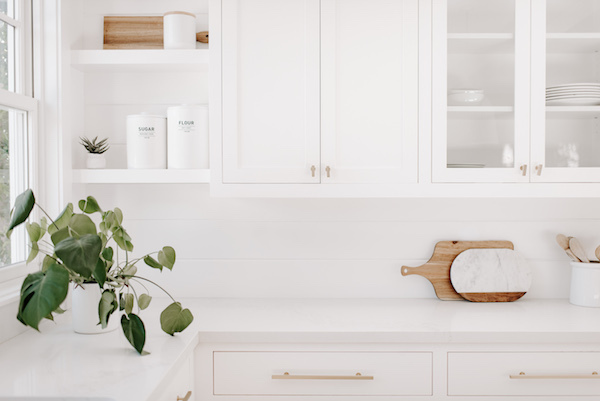 Whether it's mail, kids artwork, groceries, trash or recipe books lying around, most of us have found our kitchens crammed full at one time or another. Take a few minutes this week to try one of my quick kitchen declutter tips and enjoy some extra clear space while you cook! 1. Clear your counters. Put away everything that doesn't really need to be there. Clean counter tops will make your kitchen feel spacious and clean. The trick is to put things away where you can get them out and put them back quickly and easily! 2. Take paperwork off your fridge. Yep, take it all off, throw out anything outdated, pay or schedule the bills, scan the kids artwork with your iPhone and save it on your computer and throw away any damaged magnets so you can't put as much up next time..
4. Do you usually dump mail in the kitchen? Pop a pretty box on top of your fridge and use that as a dumping ground. Then take 10mins at night to go through and action the mail - every night or once a week, depending on how much you have). It's a great tip I picked up from the PaperFlow book and it means paperwork doesn't go missing and doesn't leave my kitchen (and fridge) overrun with papers. 5. Set your timer again for 10 minutes and go through your fridge and pantry. Throw out everything out of date and group like items together. Much easier now when you write your next grocery list! If you're doing any of these tips this week, grab your phone and take a before & after shot and show me in our FREE Facebook Group so I can see how you go! * This post contains an affiliate link for the Paper Flow book - if you buy it through my link, I receive a small commission. Love your ideas Marissa - especially how to store the kids art work - I feel a little guilty taking them down sometimes.